Make an impression on your customers with clean, clear menu selections displayed in the Winco PMC-9U Single Burgundy Menu Cover 9-1/2" x 12" This high visibility, double-sided single panel menu wipes clean easily for a sanitary presentation that your guests will appreciate. It's 9-1/2" by 12" viewing area can easily hold standard sized paper menus that you can design and change as needed, and that slide easily into the pocket. 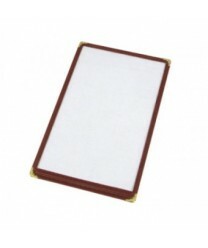 Easily stackable, this burgundy menu cover boasts brass corner protectors for a sharp and sophisticated look.